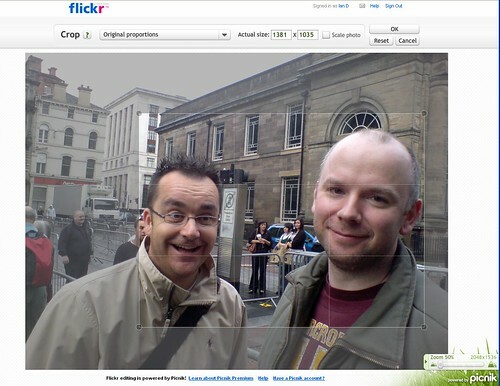 Photo editing has arrived at Flickr. It makes use of Picnik and having a play around this morning it looks very easy to use and pretty feature rich. You can easily edit any photo, add effects, play with contrast and colours, resize and crop and also apply an ‘auto fix’. It’s nice to have these tools online as opposed to on your computer. Not all photo’s need Aperture or Lightroom and it’s great you can do this editing from anywhere while easily saving results within Flickr. I wonder if it works on the iPhone? I think that this photo would benifit from a bit more cropping and resizing? Who’s the fat bald guy on the right. And if I’m not mistaken, isn’t that Bert on the right? Err… I meant left for Bert. Quality comments Graham. Made me LOL.